Notaries are not allowed to certify public documents. All copies must be certified by the government office that holds the record. 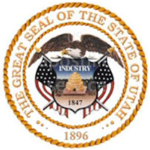 Please ensure all documents are from Utah. 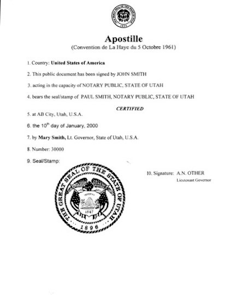 How to obtain an apostille for a public school diploma? 1. Obtain the diploma from the records or Administrative office of the school. 2. The diploma must be signed by the registrar, principal, or the president of the school. How to obtain an apostille for a private school diploma? 2. The Diploma must be signed by the registrar, principal, or the president of the school in the presence of a notary. 3. The seal must be accompanied by a Jurat paragraph or certificate.